An emerging trend, Airbnb went from having few customers to now supplying millions of rooms per night worldwide. Unlike the hotel industry, Airbnb enjoys features that make such an experience easier and more local. Because Las Vegas welcomes tourism all year round, it has a particularly unique investment position for Airbnb. Unlike almost all other resort-oriented cities with well-defined seasons, tourism in Las Vegas runs year-round. Thus, owning an Airbnb in Las Vegas enables real estate investors to enjoy a higher occupancy rate and ROI. The Las Vegas short-term rental (Airbnb) market has become both increasingly profitable and prevalent. In 2017, Las Vegas had approximately 500,000 visitors staying at homes or private apartments offered by Airbnb. with typical host earnings at an annual $7000. In 2018, 300,000 more Airbnb guests stayed in Las Vegas, creating a record high of 800,000+ total visitors staying at one of the 5,600 Airbnb rentals available. The entire Nevada Airbnb community generated $123 million in profits just last year, more than double the $47 million made in 2017. 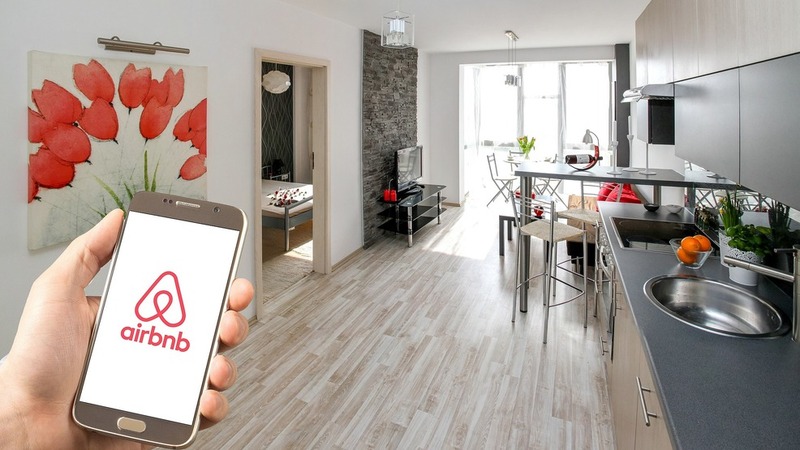 If you’re thinking of investing in your own Airbnb, the average yearly salary required to afford a median-priced home in Las Vegas is $50,728.93 with 20 percent down; the national average is $55,390.57. In 2018, the average home price in this city was $261,000 , Las Vegas is the 21st least expensive city for home buying and the average nightly earnings from an Airbnb is $144.53, which means it'd take just over nine days to cover the average mortgage payment. Zoning Code—Refer to Title 19 of the Las Vegas Municipal Code for the complete Zoning Code. Short-term rentals differ from long-term rentals; in some areas renting for less than 30 days is not permitted. Refer to this code to learn of the eligibility of your investment property. This code will tell you whether you can rent your property as a bed and breakfast, hotel, motel, residence hotel or short-term residential rental. Business License: In order to start renting your Airbnb investment, you must obtain a Business License from the Business Licensing Division. Failure to register could lead to fines, penalties, and/or disruption of the rental business. To learn more, visit LasVegasNevada.gov. Short-Term Residential Rental Permit: Short-term rentals of 30 days and less require that you obtain this permit in order to operate. To receive the permit, you as a real estate investor ought to comply with noise regulations, parking requirements, and any other conditions. Reach out to the city’s Planning Department to learn more about the regulations and process. Building Codes—Refer to Title 16 of the Las Vegas Municipal Code. Alongside the business license and permit, you must adhere to the building codes. The code will tell you all about the requirements for design, maintenance, and construction of the property. It will, moreover, explain the safety, health and habitability regulations that you need to comply with. Transient Lodging Tax—Finally, you ought to pay this tax if you are renting for less than 30 days. Both Cook County and the City of Las Vegas charge a transient lodging tax for hotels, vacation rentals, inns and other short-term rentals. Legal codes and restrictions have made owning a house for short-term rental much more challenging. The City Council cites "instances of poorly managed properties that turn into weekend party houses" as one of the reasons for the stricter regulations. Henderson: Rentals shorter than thirty (30) days are prohibited, the only place zoned for short term rentals is a part of Lake Las Vegas. City of Las Vegas: Short-term rentals will have to pay $1,030 in fees to the city when they apply for a special-use permit. A Special Use Permit requires the notification of neighboring property owners and a two-part hearing process before the Las Vegas Planning Commission and the Las Vegas City Council. All short-term residential rentals must obtain a business license prior to operating. The license application has special requirements and restrictions such as limiting overnight guests to 12 or fewer per property, and keeping Airbnb within 660 feet of each other. North Las Vegas: The city of North Las Vegas does not have a short-term rental ordinance. Disclaimer: Governmental Regulations, Fees, Fines, and Penalties are subject to change. The corresponding information within this article is representative of the Governmental Regulations, Fees, Fines, and Penalties at the time of writing.